VS-102 - H.264 (MPEG-4) HD/SD Encoder/Decoder with HD-SDI, HDMI, Composite, IP inputs/outputs | AdvancedDigital Inc. The VS-102 is a low-cost H.264 encoder/decoder supporting SD and HD live encoding. The VS-102 is available in two models, VS-102-HDMI and VS-102-HDSDI. The VS-102-HDMI, supports HDMI and composite inputs. 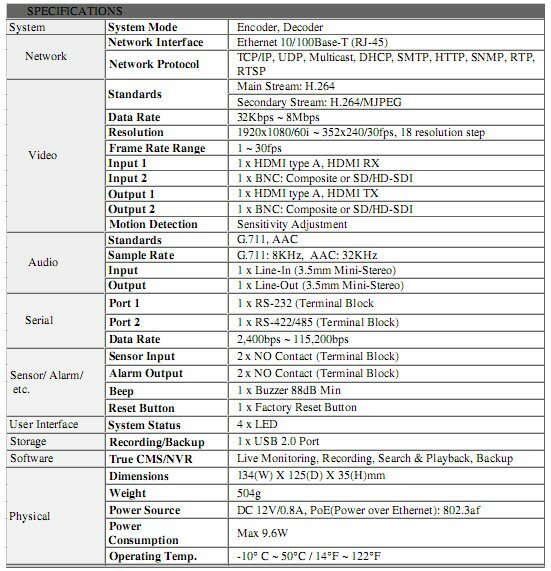 While the VS-102-HDSDI supports the broadcast standard HD-SDI input, in addition to HDMI and composite. The VS-102 offers as output an H.264 encoded IP stream compatible with Content Delivery Networks (CDN) and the Wowza Media Server. Audio is encoded as a bidirectional AAC high-definition stereo. The VS-102 can act as either an encoder or a decoder. This allows a pair of VS-102 units create a point-to-point broadcast system over any existing IP networks. For example, the unit can operate as an encoder to compress and transmit A/V data over a LAN to another VS-102 located elsewhere. A second unit can then act as a decoder which receives the compressed data through the LAN and outputs it using it’s HD-SDI port. Additionally, other computers or VS-102 decoders connected to the same network can monitor both the audio and video in multiple locations at the same time. When properly configured, the VS-102 may be monitored through the public Internet.